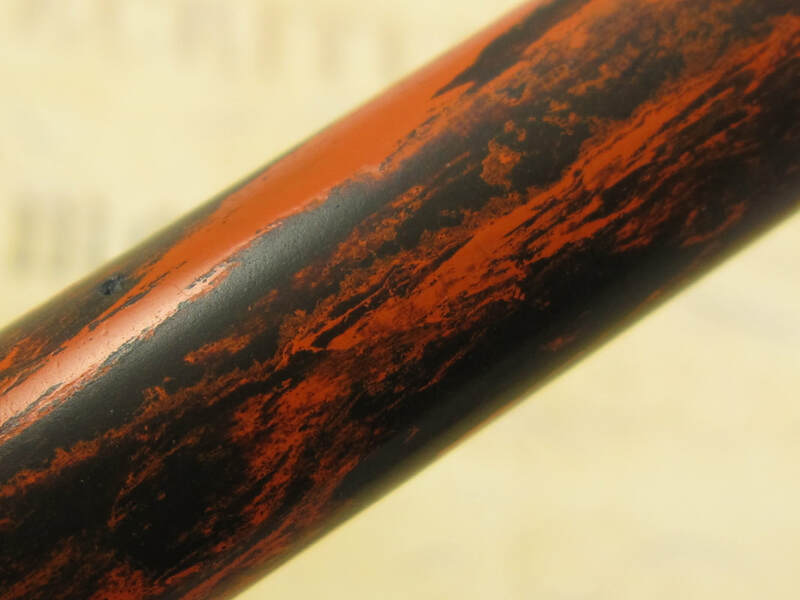 COMMENTS: Wahl fountain pen in red mottled hard rubber and gold trim. 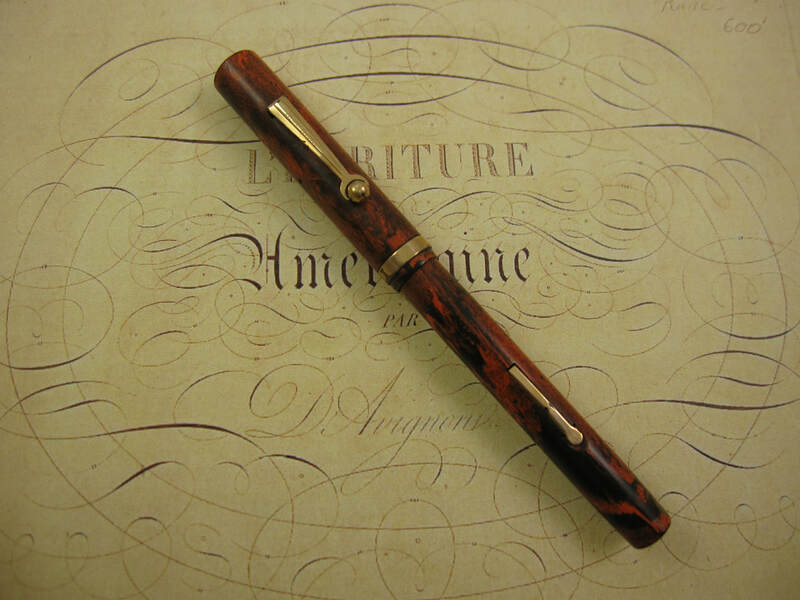 This pen has a much lighter color and a different color pattern than the more common Rosewood. Gold band by the cap lip. Rollerball clip. Fitted with a 14k Wahl #2 superflex nib that writes a fine to triple broad line. Professionally adjusted nib, ultra smooth and capable of writing at any speed when not flexed. An astonishing hard rubber color with lots of color vibrancy. Some tarnish and brassing on the gold trim. Otherwise, this is an ultra clean pen. Lever filler mechanism. New sac. Made in USA in 1920s. HUGE PEN & NIB !!! 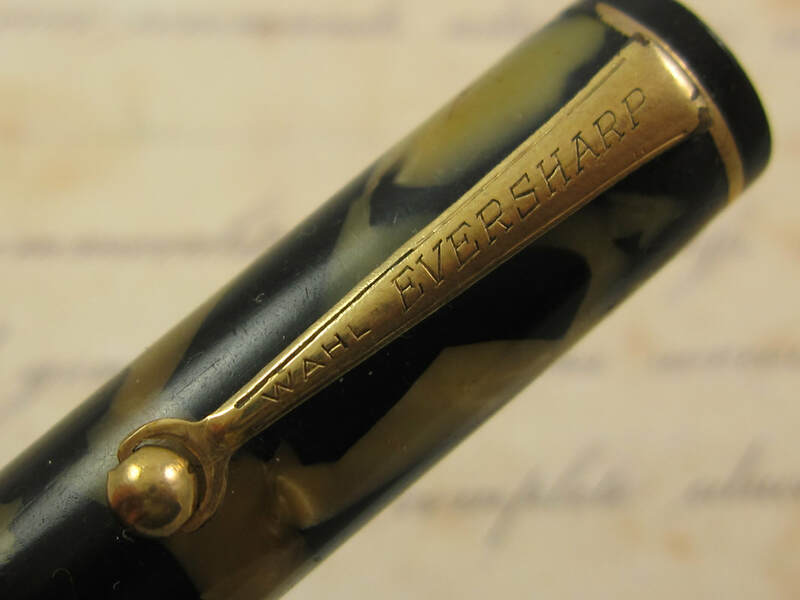 COMMENTS: Wahl Eversharp Oversized Equipoised fountain pen in jet black color and gold trim. 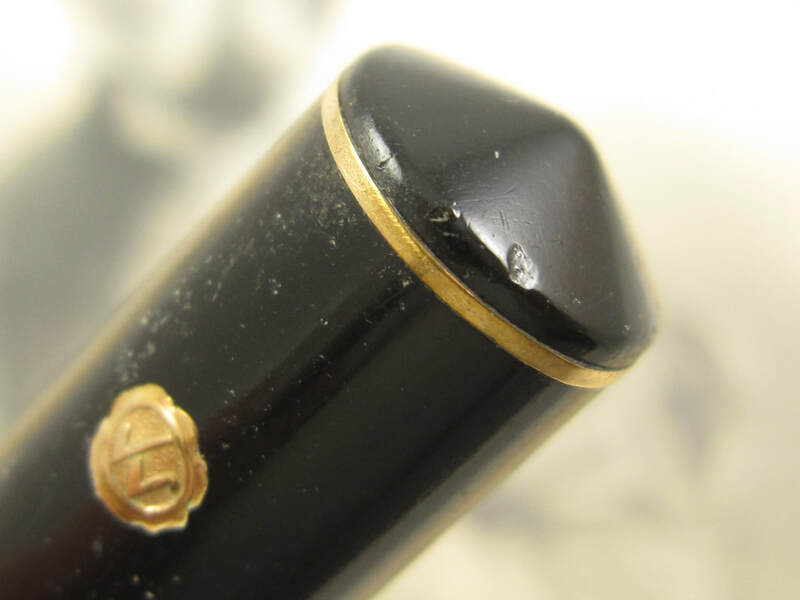 Triple gold band by the cap lip. Slim bands on both ends. Coned shaped ends. Roller-ball clip. 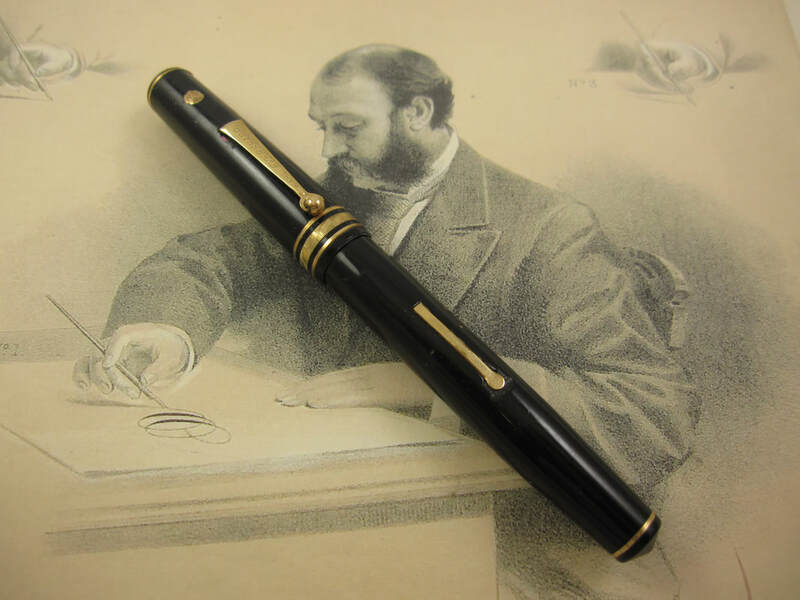 This is a huge pen, the largest version made in the Equipoised series, and a rarity for vintage standards. Pen measures 5 3/4" long (capped) and 7" long (posted). 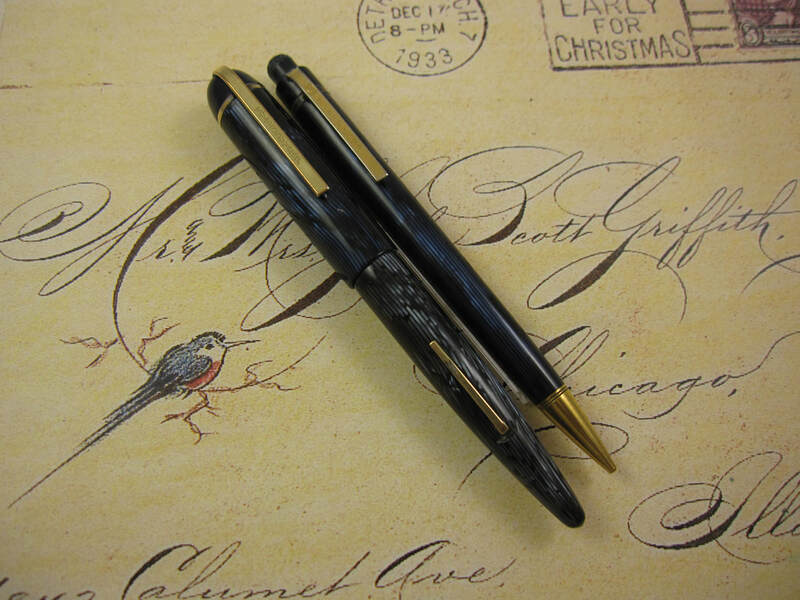 Fitted with a factory original and oversized 14K Wahl Gold Seal Manifold double broad stub nib. 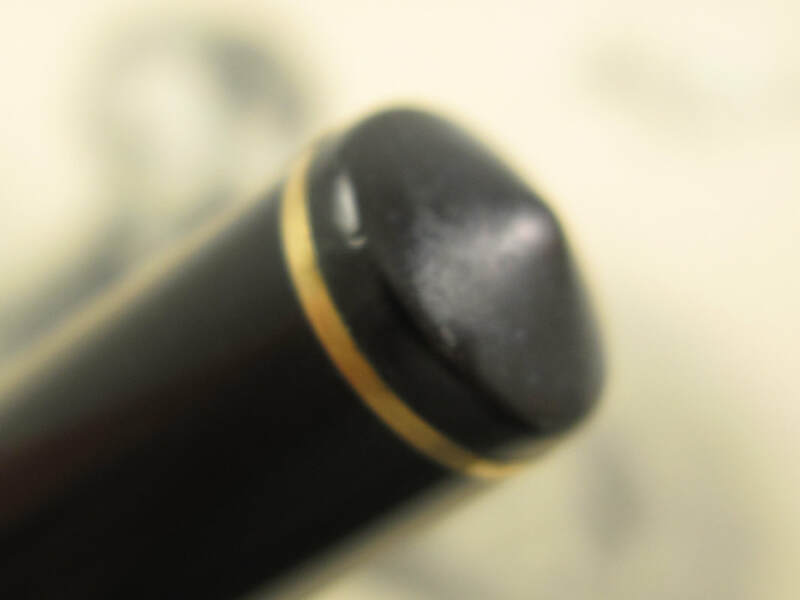 Professionally adjusted nib, ultra smooth and capable of writing at any speed. 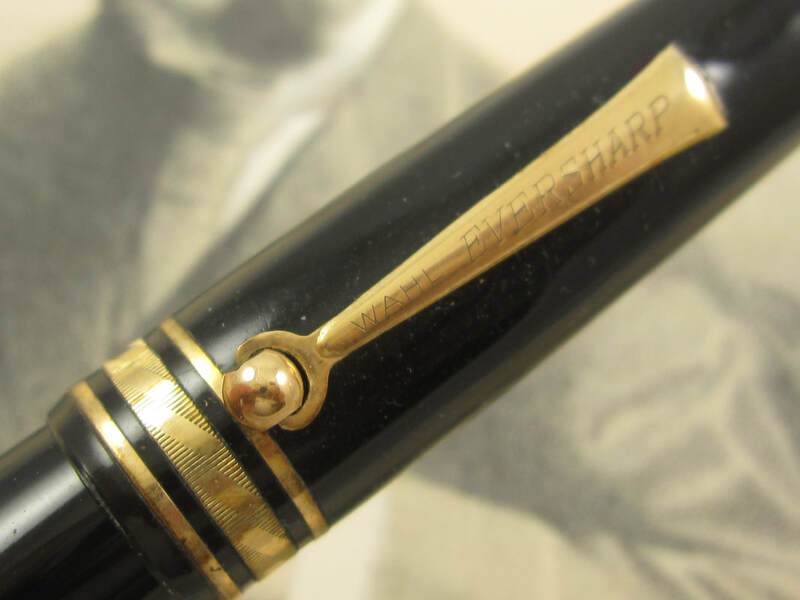 This nib is rarer than the pen body and commands a handsome value, if you can find one for sale! The exterior has some small prick imperfections by the gold seal and the lever has a small area with brassing. 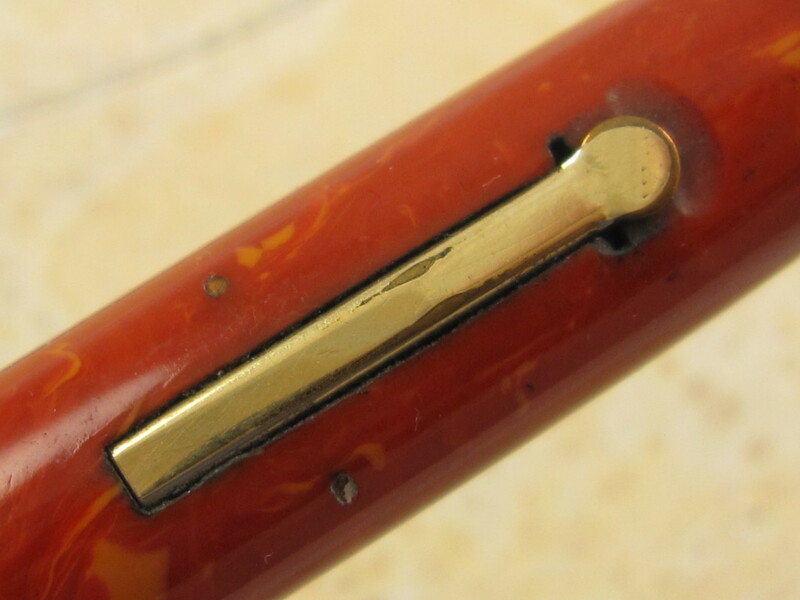 Otherwise, this is an extremely clean pen with a very nice and clip imprints. Lever filler mechanism. New sac. Made in USA in the early 1930s. Nib Type: Superflex XXXF-BB Imprints: No Length: 4 3/4"
COMMENTS: Wahl Eversharp "Tulip" fountain pen in red hard rubber and gold trim. The hard rubber is chased with the "Greek" pattern. Gold crown on the cap. 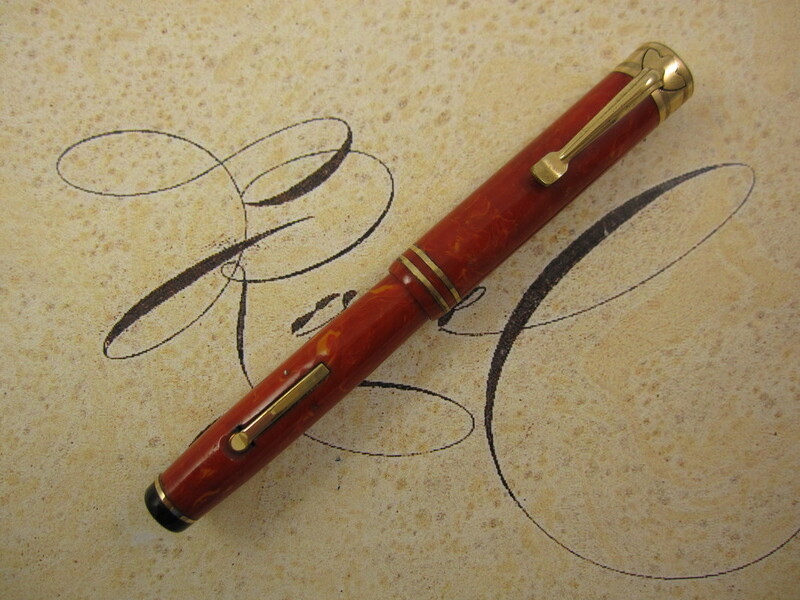 The focal point of this pen is its unique "tulip" shape clip, a very art deco and elegant feature in this pen model. This is the larger version model, longer, wider, and with the larger #4 nib. Fitted with a 14k Wahl #4 superflex nib that writes a triple extra fine to double broad line. "Professional nib", meaning this is not the regular everyday ultra smooth flex writing nib, but a nib that requires a very light and steady hand with lots of dexterity and skills using flexible nibs in order to properly use it. Please do not underestimate a professional nib as it only takes a few bad strokes to damage this very rare and expensive nib. Pen measures 4 3/4" long (capped) and 6 1/4" long (posted). Exterior color and chasing are in great condition. Some tarnish and brassing on the gold trim. Cap lip has a very small hairline, which has been repaired. Very hard to see it. Gold rings by the cap lip offer lots of rigidity and will reduce the chances of that hairline to further develop. Otherwise, this is a very clean and a very desirable pen model, especially in this size and in the red hard rubber color. Lever filler. New sac installed. Made in USA in 1920s. Nib Type: Superflex XXXF-B Imprints: No Length: 4 3/8"
COMMENTS: Wahl Eversharp "Tulip" in Lapis Lazuli celluloid and gold trim. Gold crown on the cap. 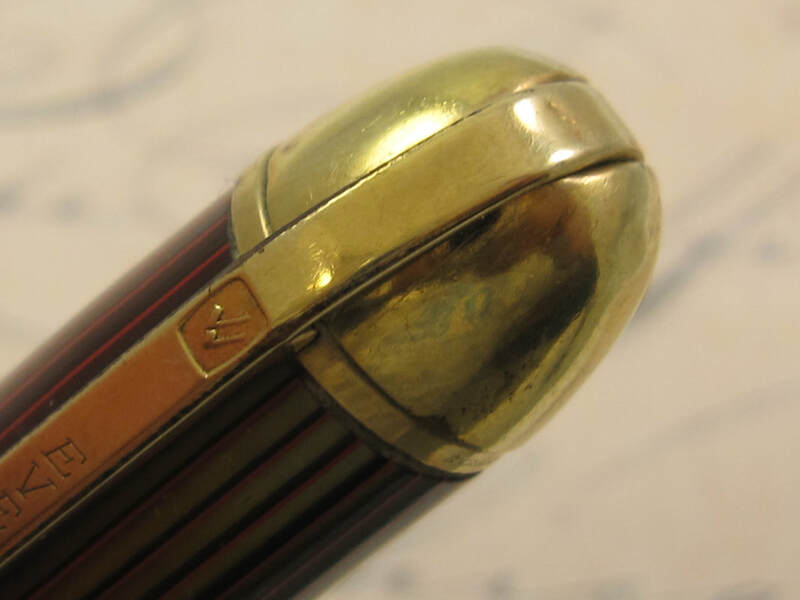 The focal point of this pen is its unique "tulip" shape clip, a very art deco and elegant feature in this pen model. 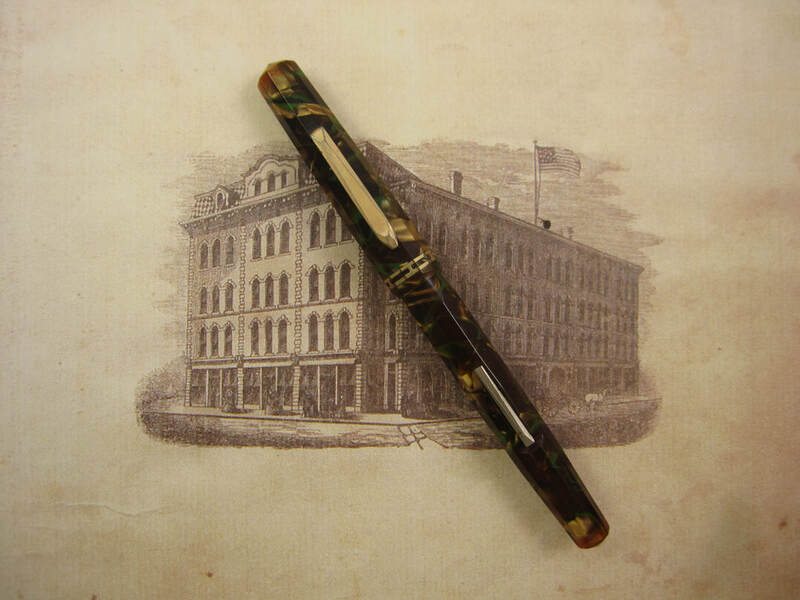 This is the smaller and more common model with the smaller #2 nib. Fitted with a 14k Wahl #2 superflex nib that writes a triple fine to broad lines (border line with double broad lines). 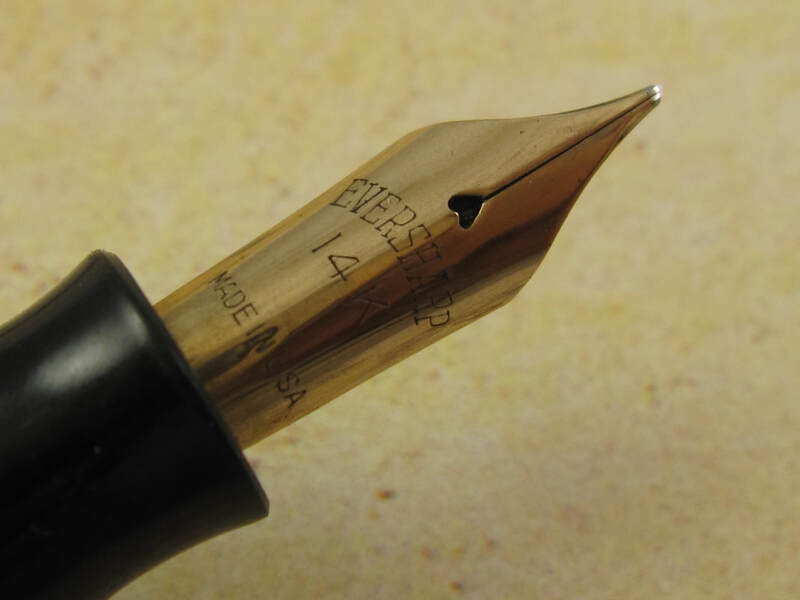 Professionally adjusted nib, ultra smooth, capable of writing at any speed when not flexed, and also capable of producing the thinnest lines a fountain pen flex nib can produce. 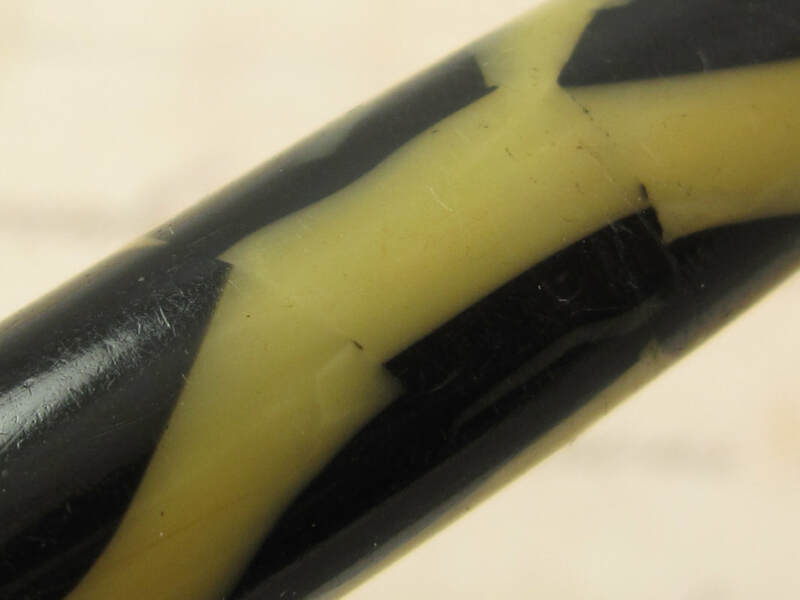 All of these unique flex attributes make this nib an ultra rare, highly desirable and very valuable flex nib. 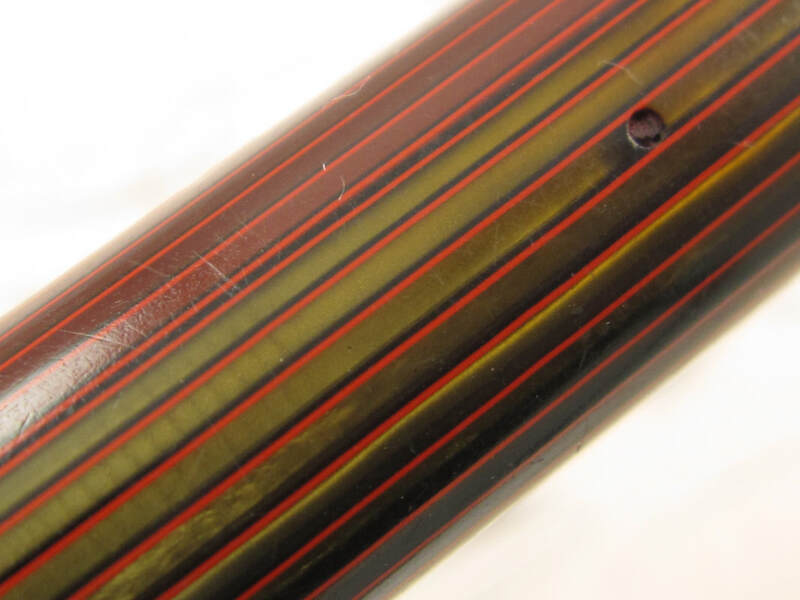 Great celluloid color with even colors and without discoloration. Perfect imprints on the gold crown. Very clean gold trim. Being very conservative by not grading this pen as in near-mint condition. Lever filler, fully serviced with a fresh new rubber sac. Made in USA in 1920s. 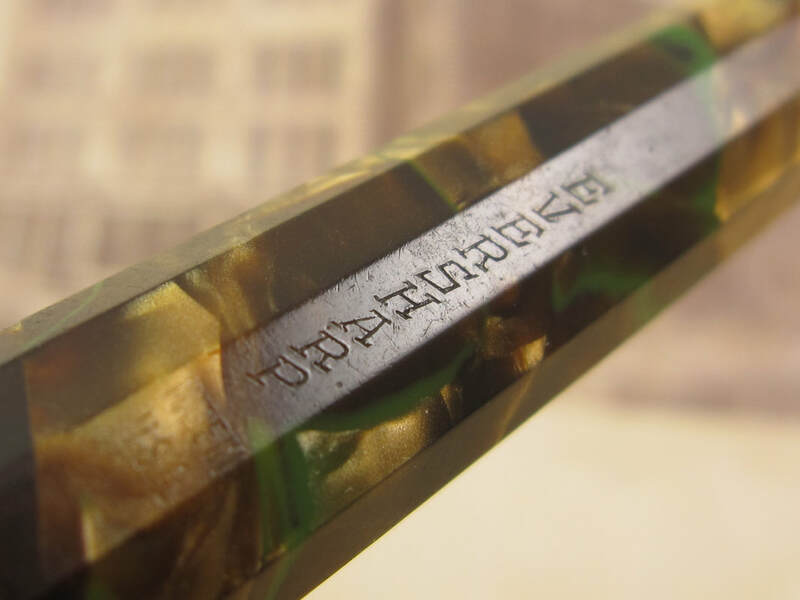 COMMENTS: Wahl Eversharp "Tulip" pen set in Jade Green celluloid and gold trim. The pen set is comprised of the fountain pen, mechanical pencil, and presentation box. Gold crown on the cap. 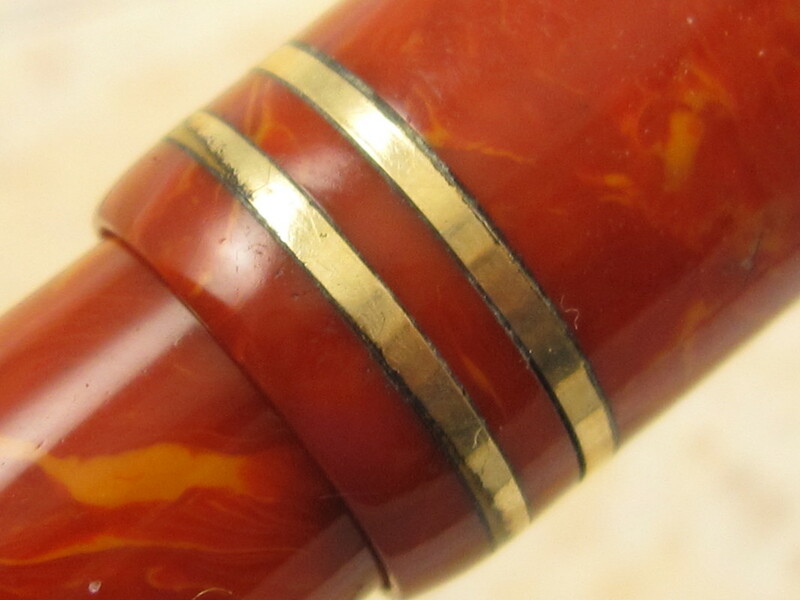 The focal point of this pen is its unique "tulip" shape clip, a very art deco and elegant feature in this pen model. 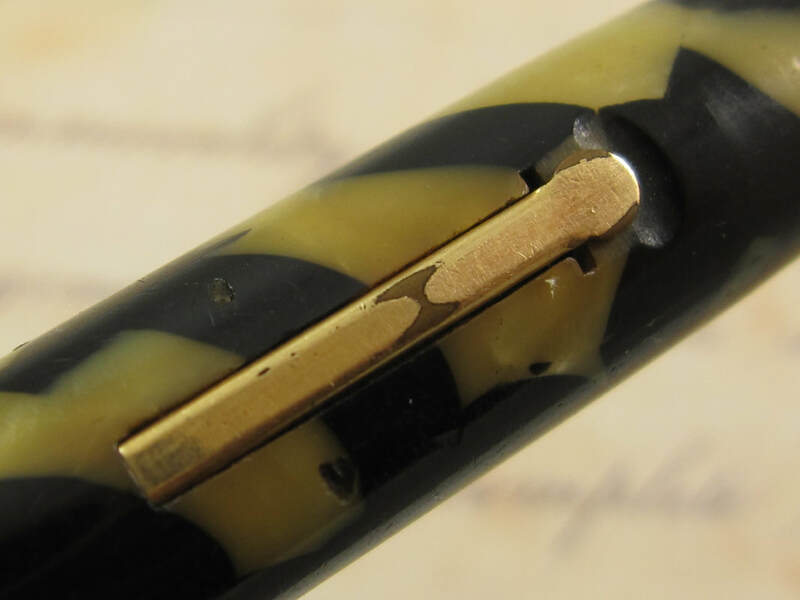 This is the smaller and more common model with the smaller #2 nib. Fitted with a 14k Wahl #2 medium flex nib that writes a broad to double broad line. 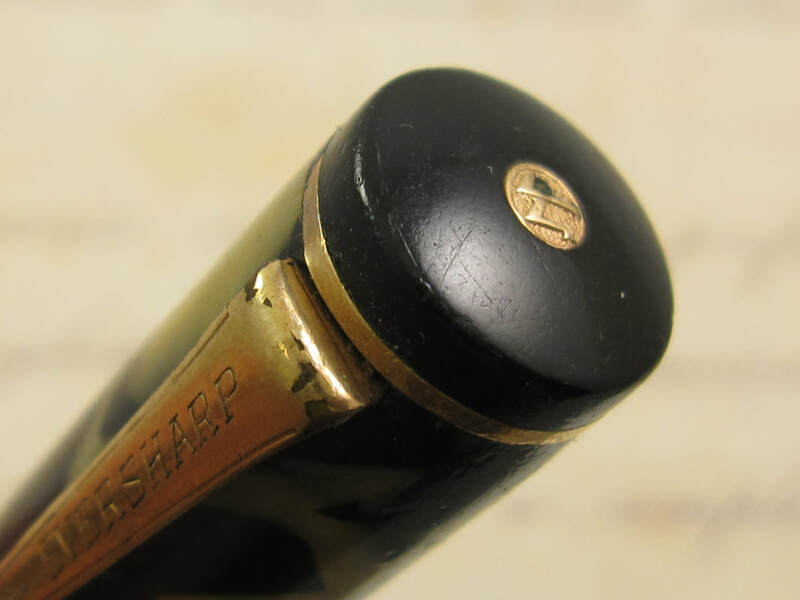 While this nib is not a true stub, it is "stubbish", meaning the vertical lines are quite thicker than the horizontal lines. Professionally adjusted nib, ultra smooth, with a very rounded tipping profile, and capable of writing at any speed when not flexed. 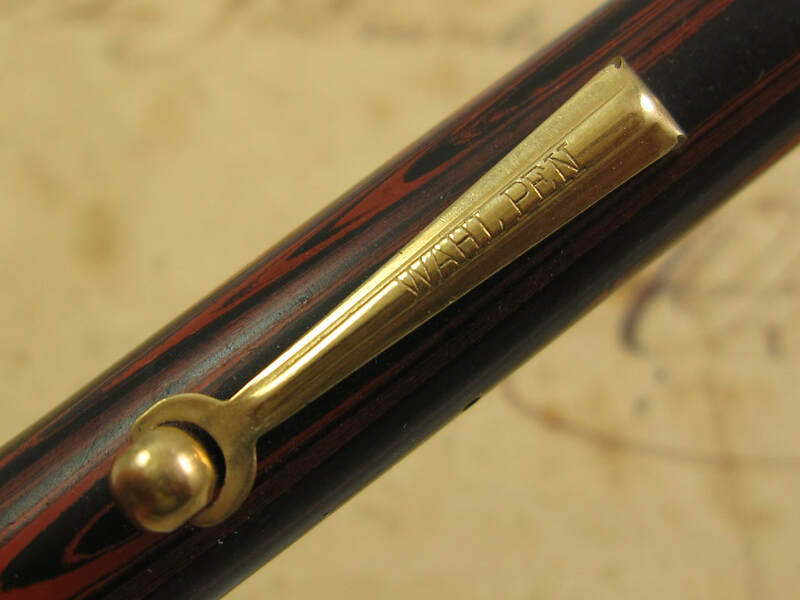 Pen measures 4 3/8" (capped) and 5 3/8" (posted). 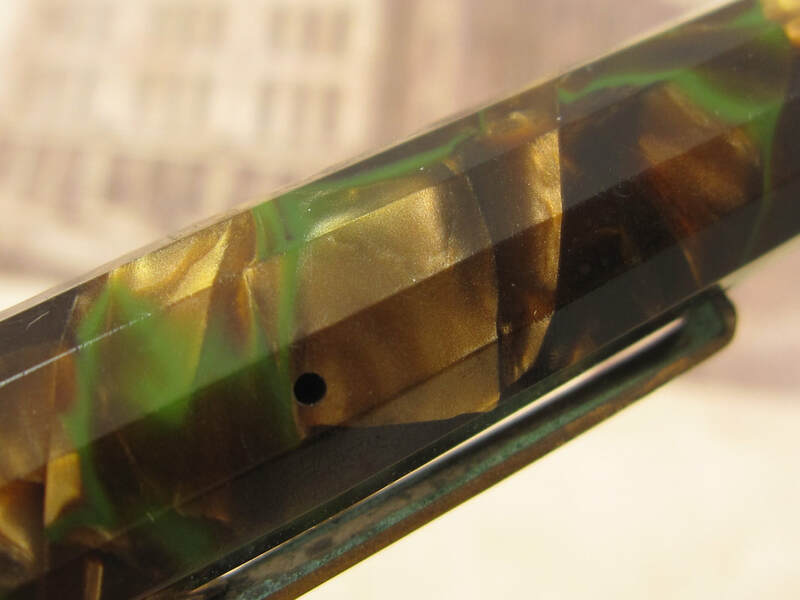 The jade green celluloid has some discoloration in the fountain pen. Gold trim is very clean. Perfect imprints on the gold crown. Lever filler pen. Fully serviced. New sac. Made in USA in the 1920s. 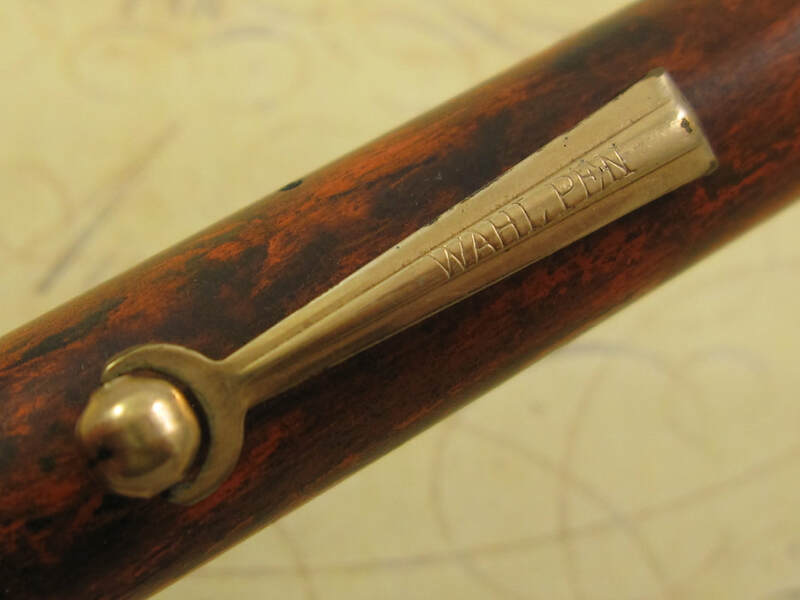 COMMENTS: Wahl Eversharp Doric 1st. 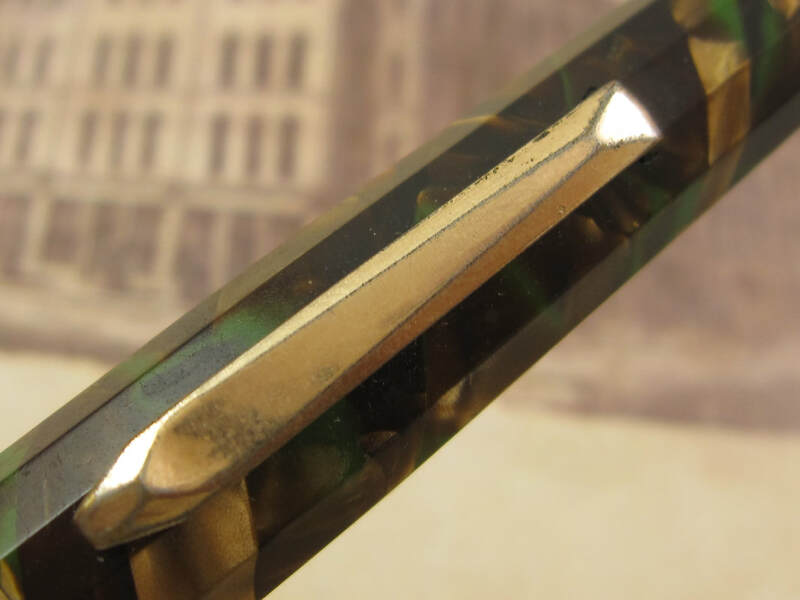 Generation in marbled bronze and green celluloid color and gold trim. 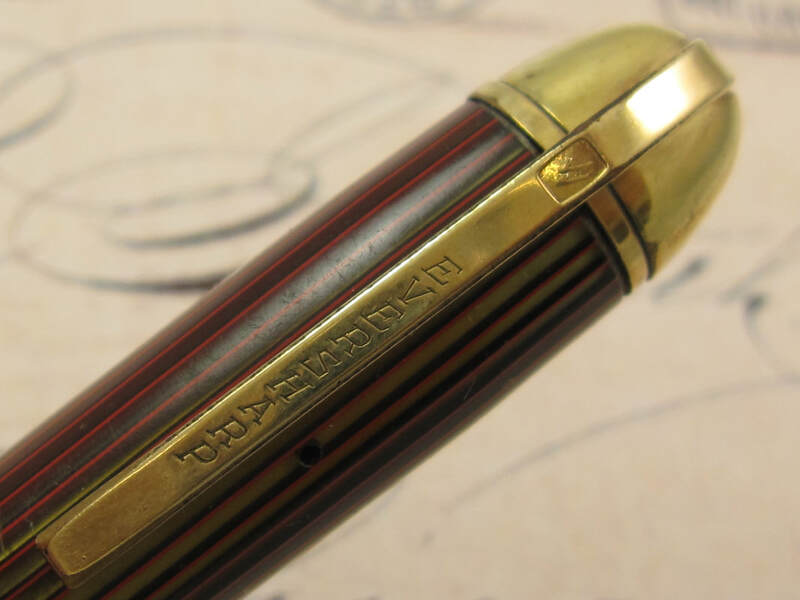 Doric pens are considered one of the most Art Deco fountain pen models of this time. They have a 12-faceted barrel and cap profile with pyramid shape ends. 1st. generation gold-plated band on the cap end. Fitted with a 14k Wahl Eversharp wet noodle nib that writes a medium to double broad line. Professionally adjusted nib, ultra smooth, and capable of writing at any speed when not flexed. 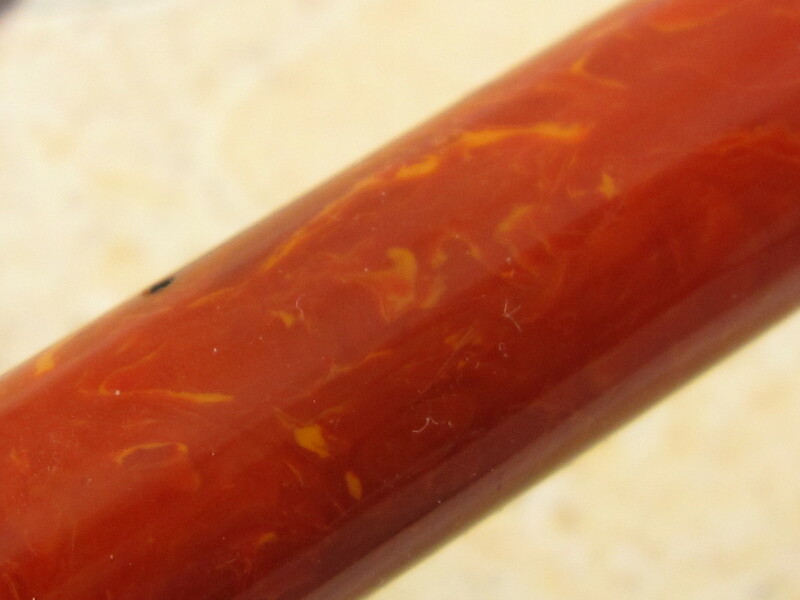 There is some crystallization or the ends of this pen. Minor gold plating loss in the gold trim. Lever filler mechanism. Serviced. Made in USA in the 1930s. 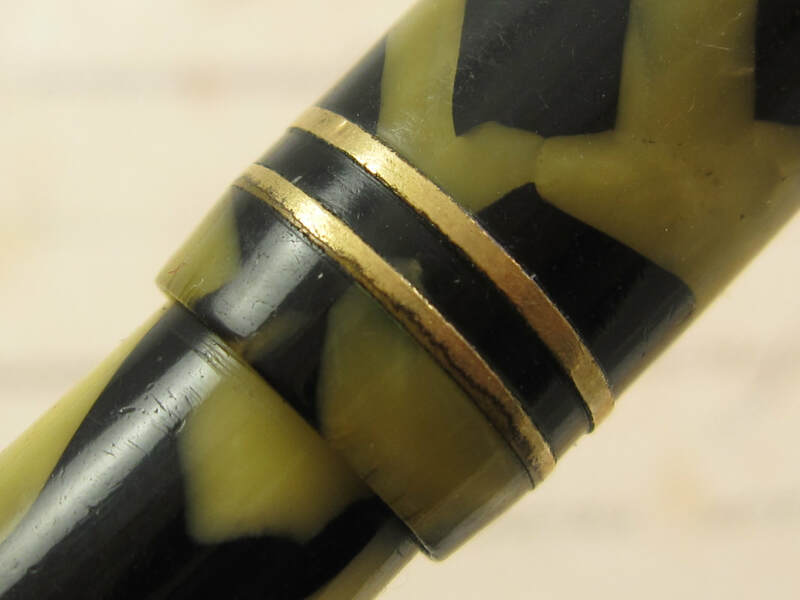 Nib Type: Broad Soft, Not Flex Imprints: Yes Length: 4 5/16"
COMMENTS: Wahl Eversharp fountain pen with the "Tulip clip" in Coral celluloid and gold trim. The Tulip name comes from its very styled art-deco clip, which looks like a tulip flower as it joins to the gold crown at the end of the cap. The Tulip clip is the focal points of this pen. 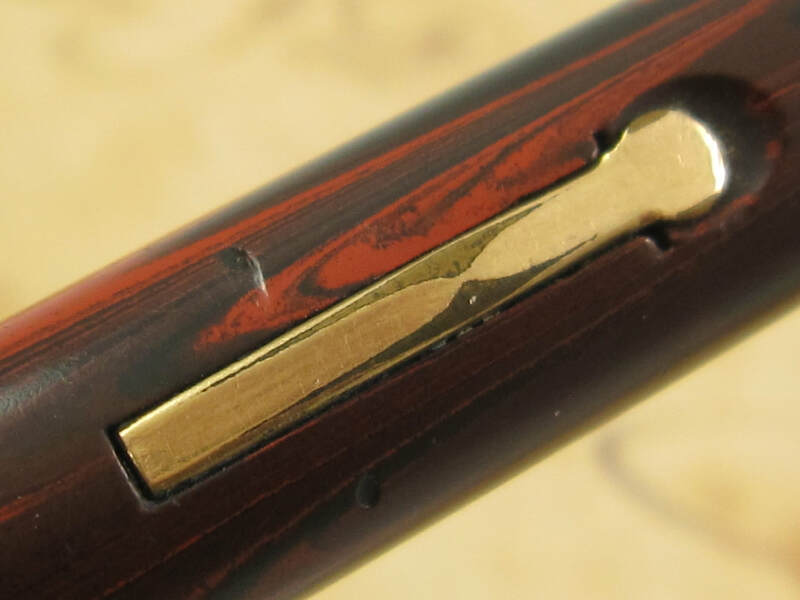 A gold crown on the upper end of the pen, two slim gold bands on the cap, and one additional slim gold band at the end of the barrel. Fitted with a 14k Wahl Eversharp #2 Broad soft nib. 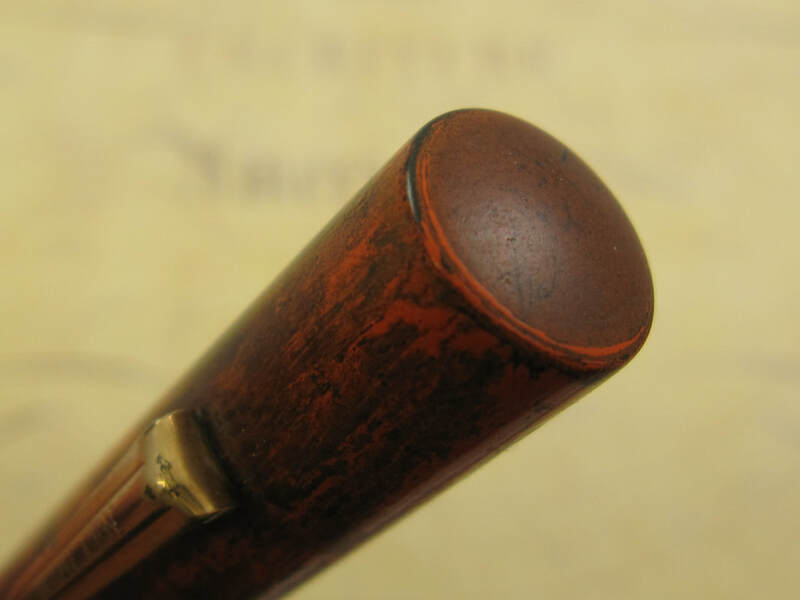 This is a "soft" nib, meaning it provides a little give when applying some pressure, but it is not what I call a flexible nib. I do not recommend applying pressure to it as this nib was not designed for such purposes. 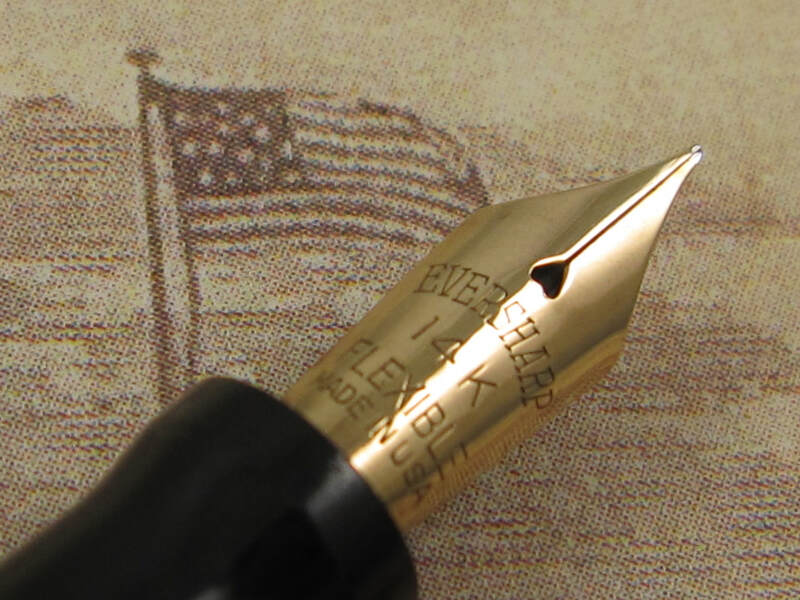 Professionally adjusted nib, ultra smooth with very rounded iridium tipping, making ideal to someone who writes fast most of the time or to an over writer. 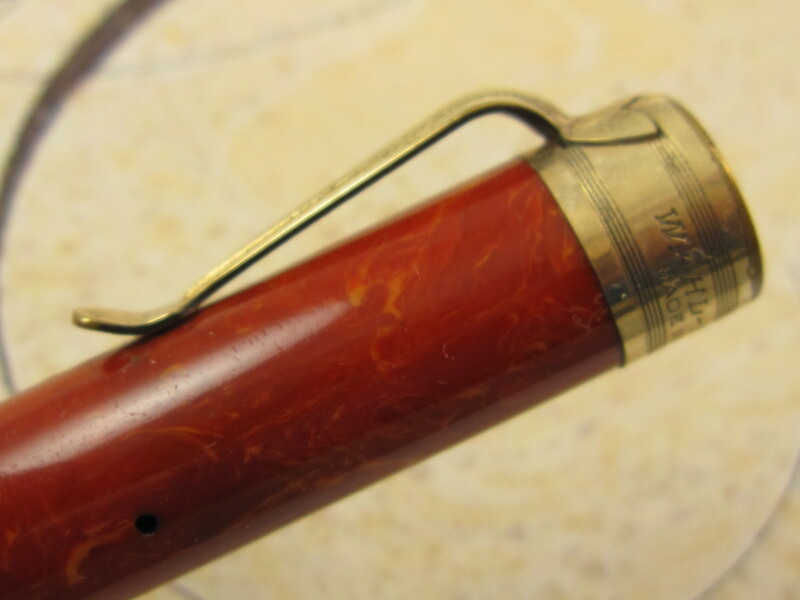 The coral celluloid color is in outstanding condition. 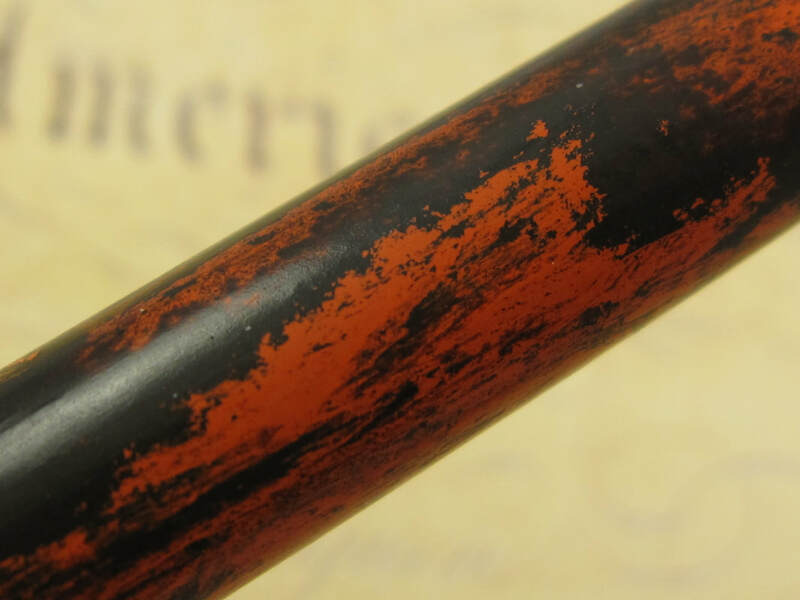 Most of the pens in this color are found heavily discolored. The gold trim has some brassing and plating loss. Otherwise, this is a very clean and a highly desirable pen. Lever filler. New sac. Made in USA in the 1920s. Nib Type: Med. 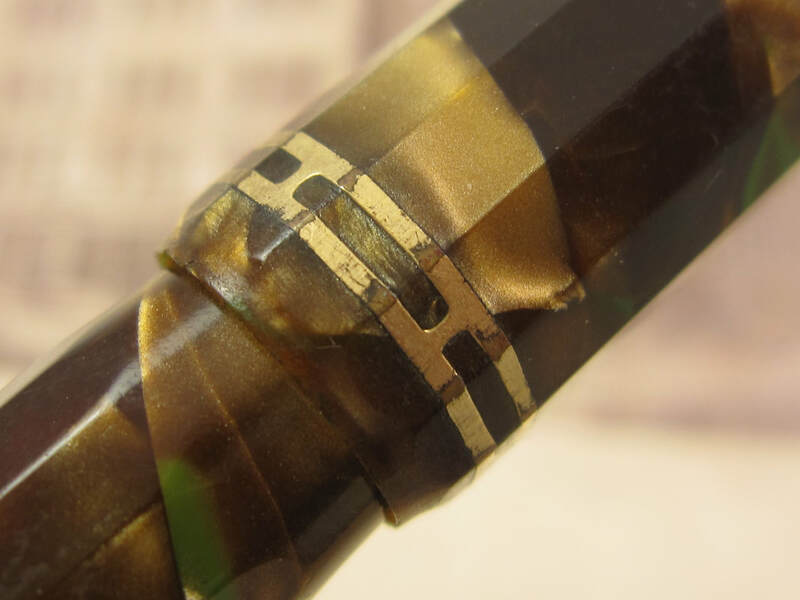 Flex XF-BB Imprints: No Length: 4 3/4"
COMMENTS: Wahl Eversharp Personal Point fountain pen in "Brazilian Green" color, which is a marbled green and bronze celluloid color. Gold trim. Gold Seal. 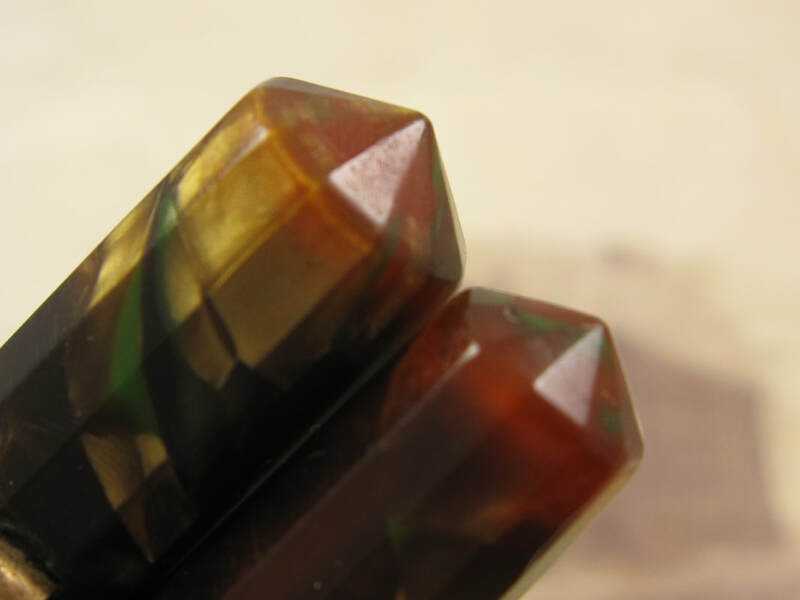 The Brazilian Green is one of the most beautiful and hardest to find celluloid colors among Wahl pens from the 1920s and 1930s. Fitted with a 14k Eversharp medium flex nib that writes an extra fine to double broad nib. Professionally adjusted nib. Ultra smooth and capable of writing at any speed when not flexed. 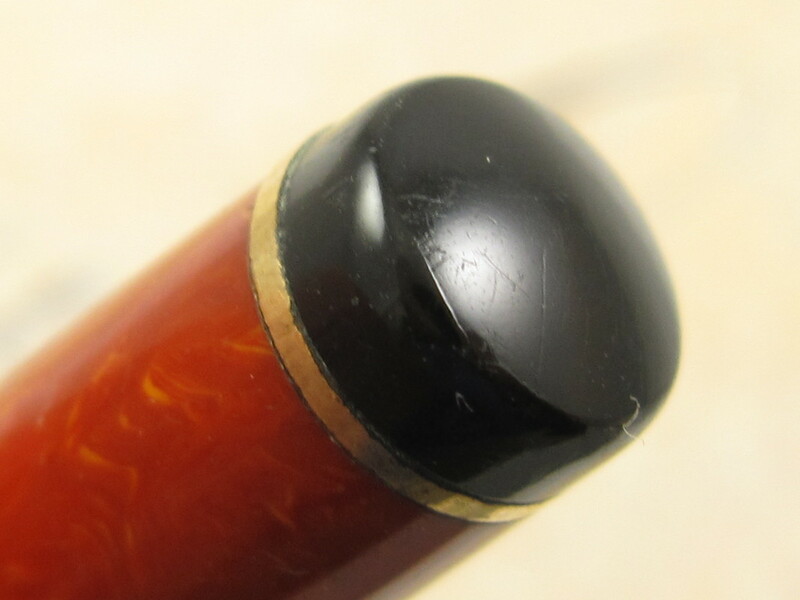 The celluloid color has some discoloration. The gold trim has some brassing and tarnish throughout. 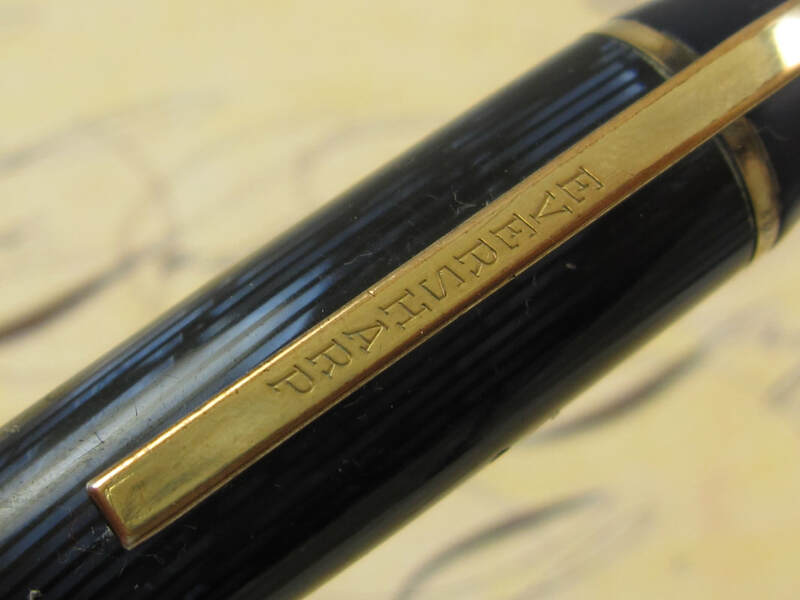 Great price for someone on a limited budget or to someone willing to venture into flex writing with a luch lower amount than a highly collectible vintage fountain pen sells for. Lever filler. New sac. Made in USA in the 1920s. COMMENTS: Wahl Eversharp Skyline pen set in Blue Moire celluloid and gold trim. Pen set is comprised of fountain pen, mechanical pencil, and presentation box. 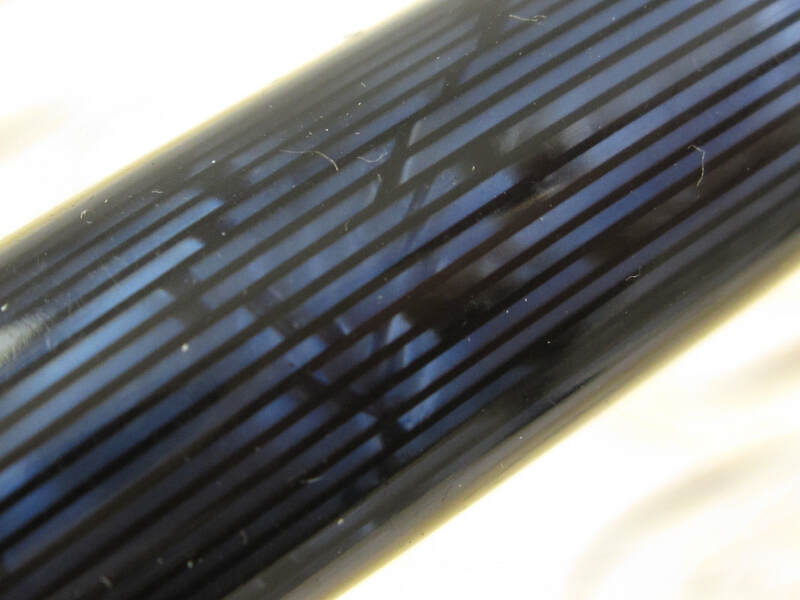 The Blue Moire is another gorgeous color among the Moire series. The cap in this pen is the bandless version (from the factory). Fitted with a 14k Eversharp wet noodle nib that writes a fine/medium to triple broad line. Professionally adjusted nib, ultra smooth, capable of very thin lines, and capable of writing at any speed when not flexed. 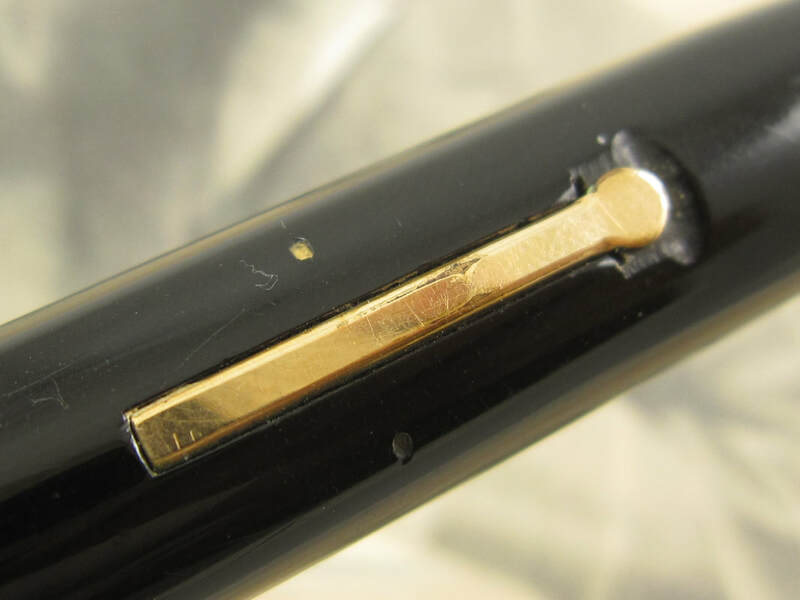 Iridium tipping in this nib is very rounded, making it an ideal nib to someone new to flex nibs, someone who writes fast most of the time or to an over writer as it is a very user friendly and forgiving flex nib. Color is in the great condition. Some tiny spots of brassing. Otherwise, this is an extremely clean pen set. Pencil used the push mechanism. It is working and in great condition as well. 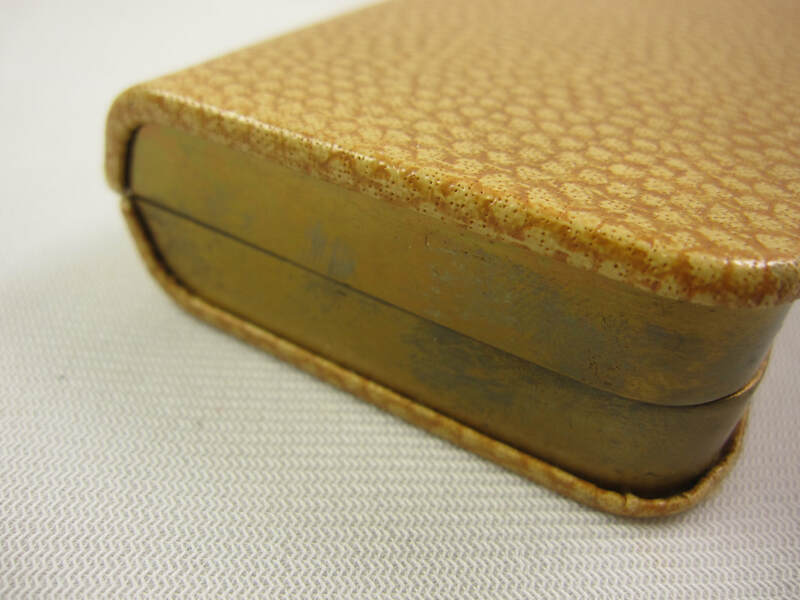 Presentation box is original, hard shell style, cream light brown and color colored exterior, gold color outer contour, and cream colored interior. Lever filler. New sac. Made in USA in 1940s. 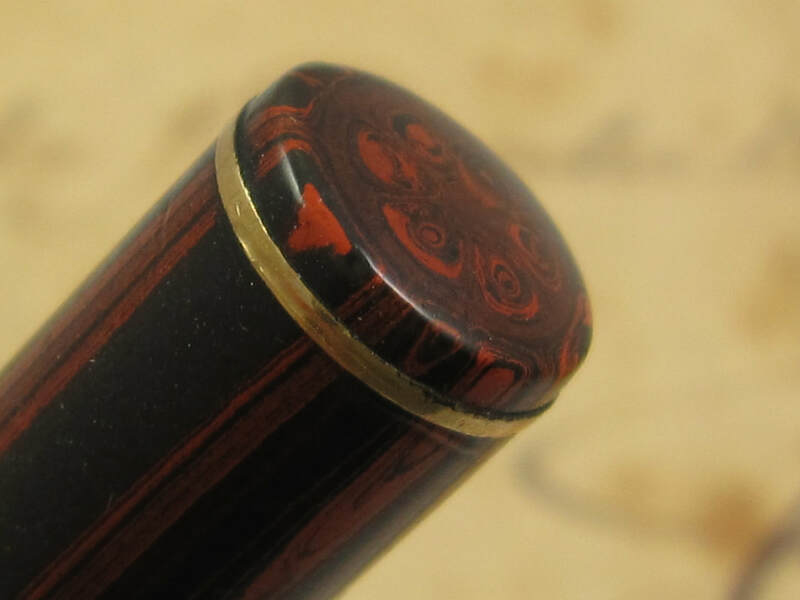 Nib Type: Superflex F-BB Imprints: No Length: 5 1/4"
​COMMENTS: Wahl fountain pen in "Rosewood" hard rubber and gold trim. Rollerball clip. 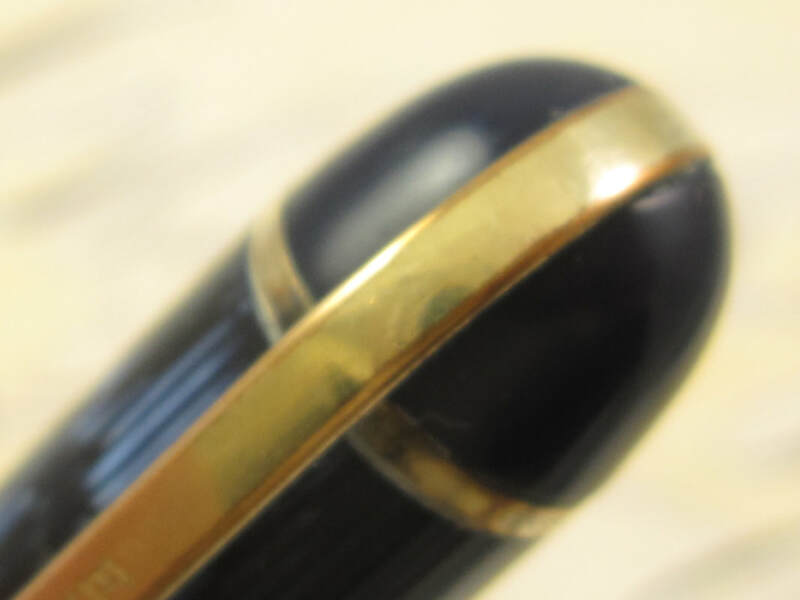 Two slim gold rings by the cap lip and one slim gold ring at the end of the cap. Full sized pen. Fitted with a 14k Wahl Eversharp superflex nib that writes a fine to double broad line. Professionally adjusted nib. Ultra smooth. 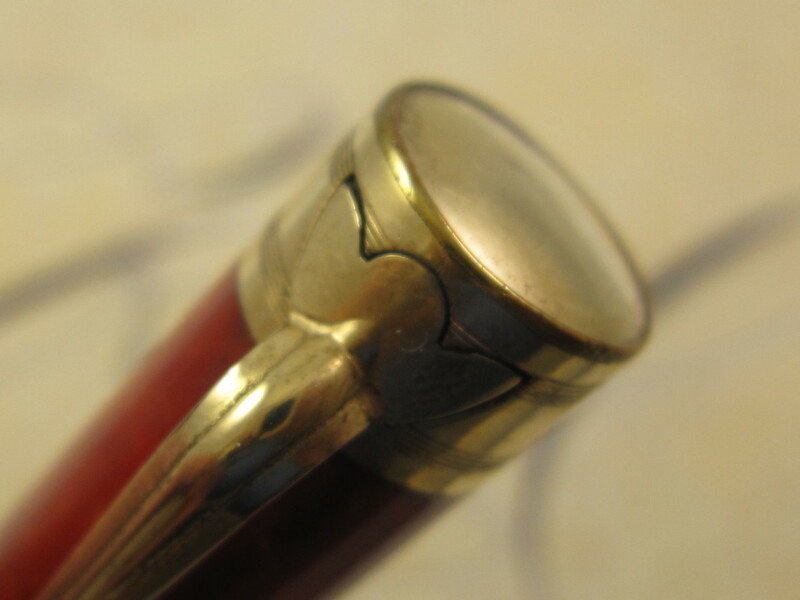 Very rounded tipping, making it a very pleasant nib to write with, and ideal to lefties or over writers. Gorgeous hard rubber color and with very vibrant colors. Very clean gold trim. Lever filler. New sac. Made in USA in 1920s. 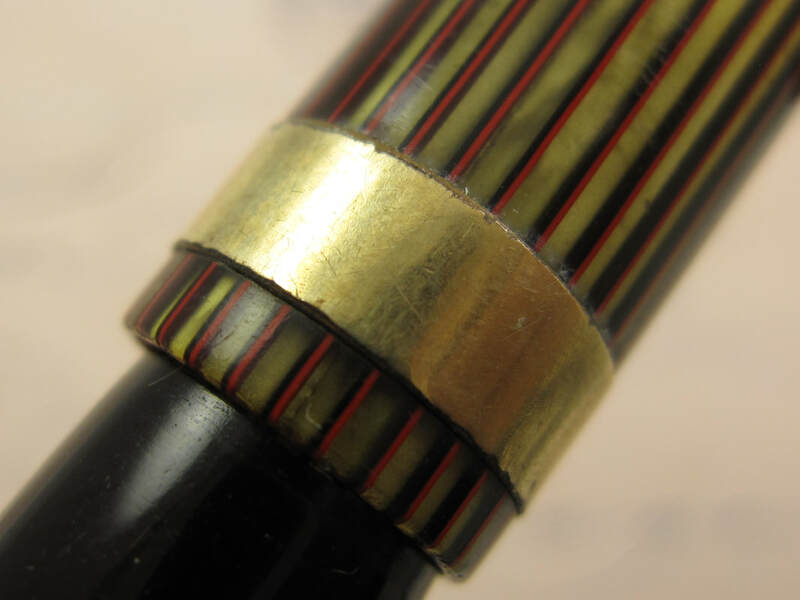 Nib Type: Superflex M-BB Imprints: No Length: 5 1/4"
COMMENTS: Wahl Eversharp Skyline with jet black barrel and striated red and gold celluloid cap. Gold trim, gold derby, and a wide gold band on the cap. 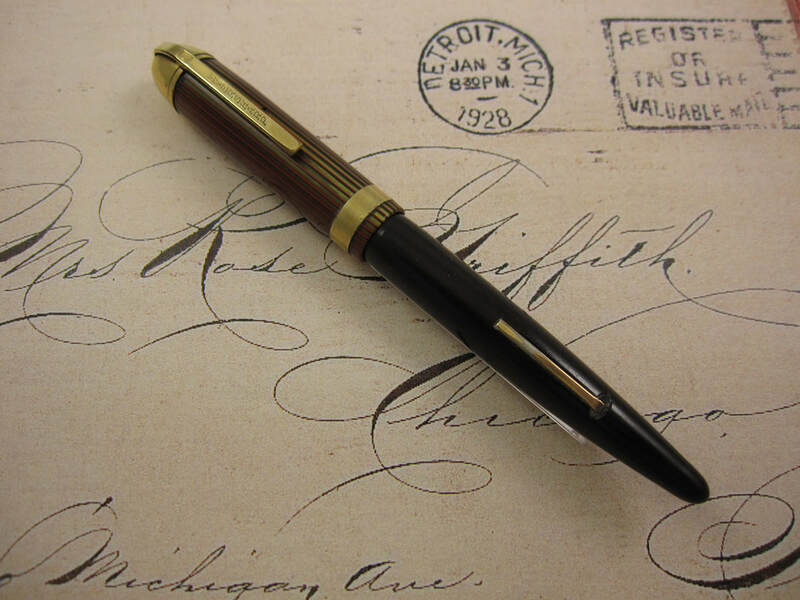 The gold derby is the focal point in this pen. 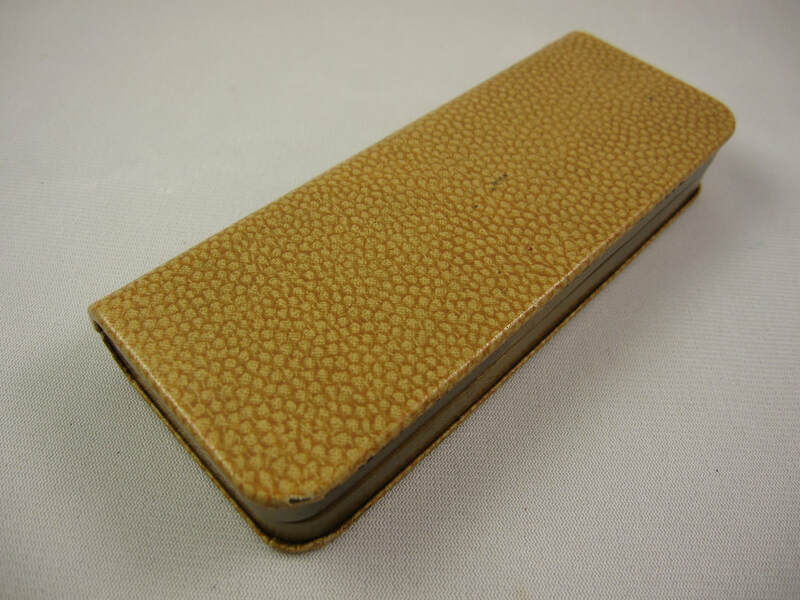 Absolutely gorgeous celluloid color and style. Fitted with a 14k Eversharp superflex nib that writes a medium (border line with a broad) to double broad line. Professionally adjusted nib, ultra smooth nib, and capable of writing at any speed when not flexed. This pen in great condition. Tiny spots of brassing on the gold trim. Otherwise, an extremely clean little pen. Lever filler. New sac. Made in USA in the 1940s.